Earlier today I received a very interesting e-mail from a filmmaker by the name of William Sanders, who is currently working on a movie called Road Trip of the Dead. Sanders relayed a totally fascinating story to me, which he uncovered during the making of the film, and it’s one I immediately knew I had to share. 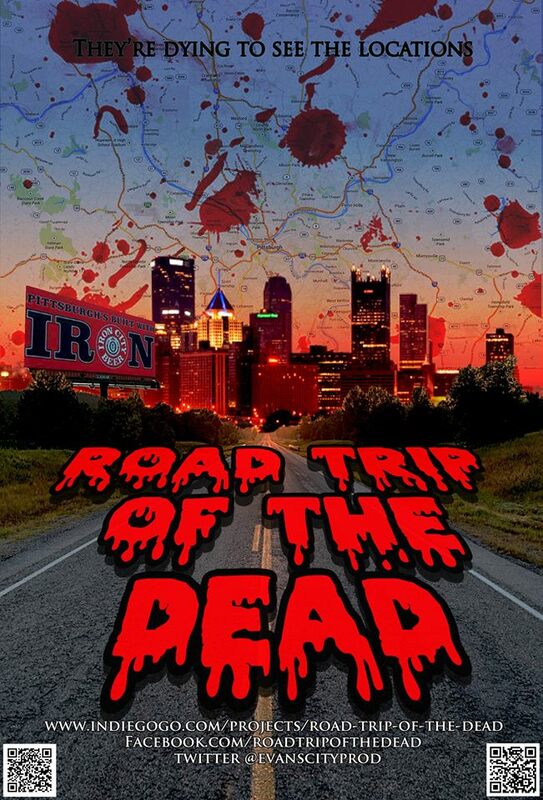 In a nutshell, Road Trip of the Dead is a found footage film about a group of friends who set out to make a documentary about Pittsburgh’s horror movie filming locations, with them soon realizing that the horror they so dearly love is fast becoming a reality. 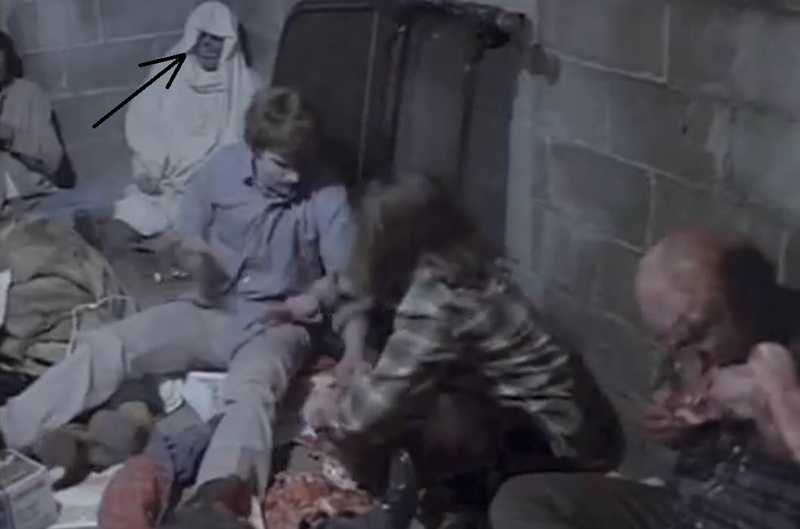 While doing research for the film, writer/director Sanders stumbled across a story about a real-life skeleton that was used in the original Dawn of the Dead (above), brought to the set by Tom Savini, who at the time thought it was merely a prop. After borrowing it from a man by the name of Larry Wintersteller, Savini dressed the skeleton up and used it as a set decoration, seen in the apartment complex early on in the film. Yes, that is indeed a real skeleton seen in the movie, and that’s merely the tip of the iceberg when it comes to that skeleton’s bizarre story. 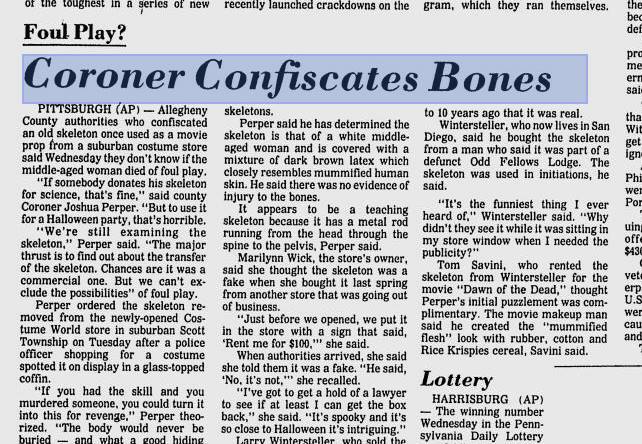 After making a cameo appearance in Dawn of the Dead, Sanders told me, the skeleton was then returned to Wintersteller, who sold it to Marilyn Wick of the well-known shop Costume World. Mrs. Wick placed the skeleton in the window of her shop, having no idea that it was the real skeletal remains of an actual human being, and she offered it up to her customers for a $100 rental fee. In a strange twist of fate, a police officer visited the shop one day looking for a costume and spotted the skeleton, convinced that it was the real deal. Oddly enough, it was the mummified ‘skin’ hanging off of the bones that tipped the officer off, though the faux flesh was actually applied by Savini on the Dawn set, made from a mixture of rubber, cotton and Rice Krispies cereal. A testament to Savini’s talents, to say the very least! Authorities arrived at the shop and confiscated the skeleton, which the coroner identified as being the remains of a woman in her mid-30s, who had died of unknown causes. Apparently, the woman had passed away 100 years prior, and nobody is quite sure how her body ended up being passed around from person to person, thought to be either a prop decoration or a teaching tool. 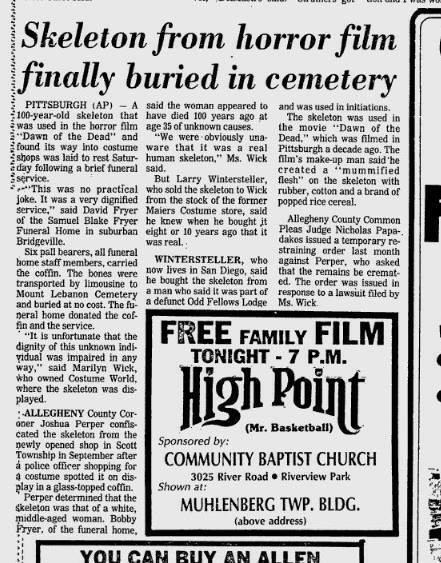 In 1982, a Pennsylvania judge ordered the remains to be buried, and the woman was indeed finally laid to rest at the Mount Lebanon Cemetery on March 19th of 1983, following a brief funeral service. Cut to 31 years later. After stumbling upon the vintage news reports about the woman’s incredible post-death journey, William Sanders tracked down the grave, which had been unmarked for the past three decades. Not only did Sanders decide to give the unidentified woman the fitting name of Dawn Doe – a reference to her cameo appearance in Romero’s film – but he also set out to raise the funds necessary to give her a proper grave marker, reaching out to fellow zombie fans in an effort to put together $1,100, to pay for the marker and cover various other fees. And here’s where the story gets even more amazing. It didn’t take long for word of what Sanders was trying to do to reach Marilyn Wick, the costume shop owner who had previously been in possession of Dawn Doe’s skeleton. Wanting to pitch in, and make things right all these years later, Wick took it upon herself to single-handedly donate the remaining funds necessary for Sanders to reach the goal amount. The money now completely raised, Dawn Doe’s grave marker is in the process of being made, set to be placed atop her grave in just a few short weeks. And so, over 150 years after her untimely death, the woman nicknamed Dawn Doe will finally rest in peace, her strange journey at long last coming to a proper conclusion. Road Trip of the Dead is currently in production, and Sanders describes it as “a hybrid of a real documentary and a found footage slasher film.” He hopes to release the movie in the spring of next year, and the plan is to include a real documentary about Pittsburgh’s horror movie filming locations on the DVD, as a bonus feature. Head over to Kickstarter to learn more about Road Trip of the Dead, where you can also pitch in to help make it even better. Sanders notes that the film will be made no matter what, but that the more money the fund raises, the better he and his team will be able to make it. Job well done, William. And kudos to you for going out of your way to bring about a beautiful end to this tragic story.